Coastal ecosystems are complex. U.S. waters encompass 11 Large Marine Ecosystem that range from the cold waters of the Arctic to the warm waters of the tropical Pacific Islands. The Great Lakes, with over 10,000 miles of coastline, are the world’s largest system of freshwater lakes. Each region is characterized by unique geological, physical and chemical properties, biological productivity and human uses. The national network of eleven regional observing system provides services to the entire coastline of the U.S. 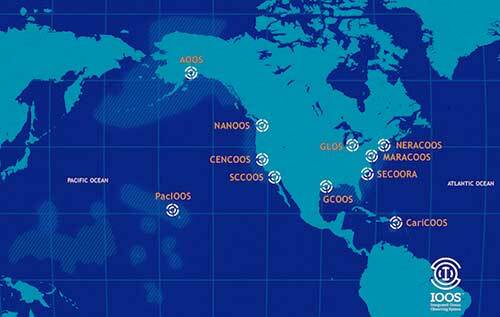 The 11 IOOS Regional Associations (RAs) design, maintain and operate regional coastal observing systems. Each RA is managed by a Board of Directors drawn from stakeholders in the region. The RAs works with agencies, industry, scientists and others to tailor an observing system to address specific regional issues.